SPEED SCHOOL!! 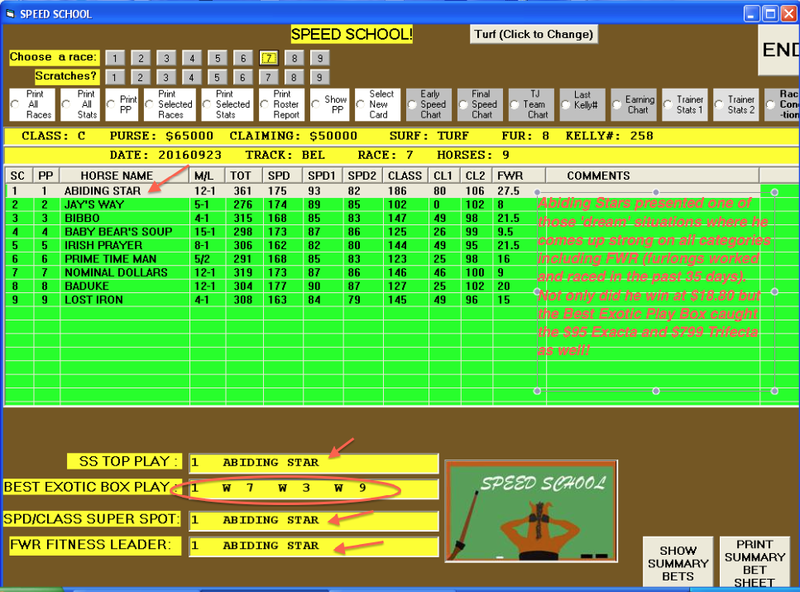 A COMPLETE ADVANCED SOFTWARE ‘COURSE’ on SUPER SPEED SELECTIONS!! 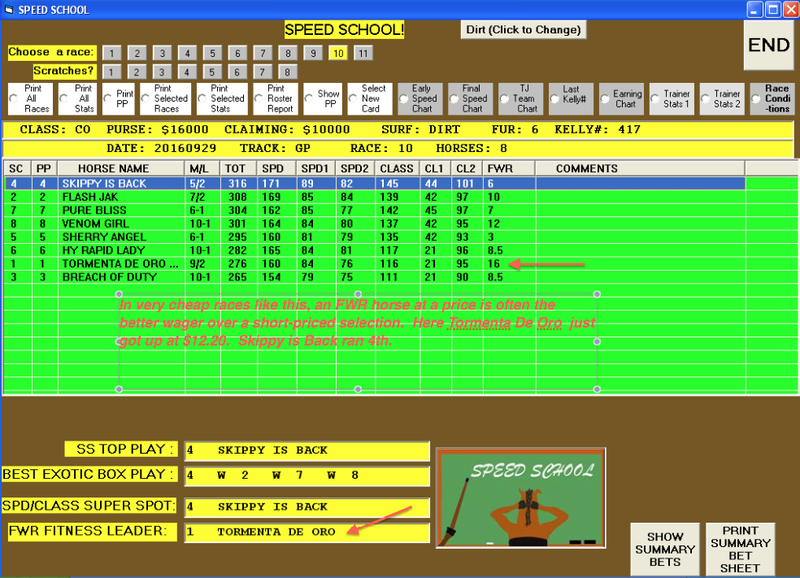 NEW SOFTWARE: A Professional Player’s Education: Locating Speed-Horse Specialists! ♦Believe it or not, horses, just like humans, go to school. No, they don’t learn ‘readin, writin and rythmetic’, but just like we two-legged creatures, they are taught skills that will aid them in their future careers. →Thoroughbreds are ‘schooled’ from a very early age. They are first taught to accept the bit between their gums. Then the weight of a saddle — followed by the weight of a saddle combined with a rider, then saddle/rider/bit/reins. They are then taught to break from an open gate, and finally from a closed gate that springs open just like at the real racetrack. We quote from ‘A Trainer’s Conditioning Guide to Developing Winning Speed Horses’, by legendary trainer Buddy Fogelson, Chapter 3, entitled SPEED WINS RACES – PERIOD!! 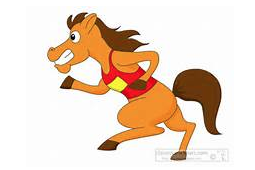 You must have your exercise rider/jock hustle with all his/her might directly after the break — horses who are left in the second half of the field after a quarter mile seldom get up to win. It doesn’t matter if your horse fades late in early training — you want to instill the ‘habit’ of speed and once you do, your runner will do all of these things on his own, with very little prompting from the rider. 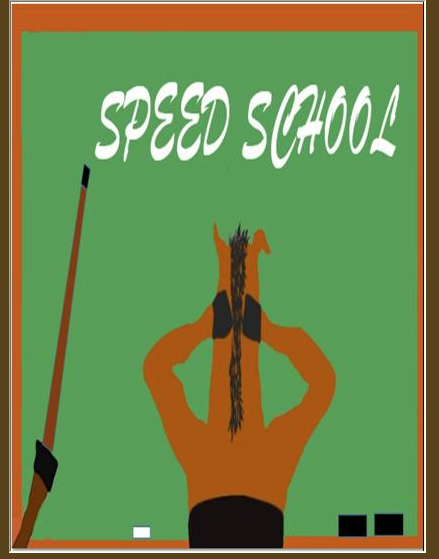 Speed School is designed specifically to identify horses who have been well schooled in the art of SPEED. Our testing (162,783 races) showed the SS TOP Play hit close to 35% (34.6) of the time with an average win mutuel in the $7.79 range. The FWR (Furlongs Worked/Raced) in the last 35 days is a unique feature that puts the spotlight on FIT or ‘Tightly Wound-Up’ horses as some players refer to it. This is a factor ignored by many players so BIG prices are often generated by this feature. The SPD/CLASS SUPER SPOT adds a ‘stamina’ dimension, i.e., finds horses able to carry their speed around two turns and on turf, and the BEST EXOTIC PLAY box hits a high % (@39%) of Exactas. CL2 = Figure that best represents horse’s ability to sustain speed beyond a sprint. FWR = Furlongs worked/raced. This is the total number of furlongs both worked and raced in the past 35 days. This is considered a ‘Fitness’indicator. Horses with a good amount of recent activity are often in good form. This is a much-overlooked factor and this column often produces good priced winners. SPD/CLS SUPER SPOT = Horses in this box win less frequently than the SS TOP PLAY but pay a higher average win mutuel. 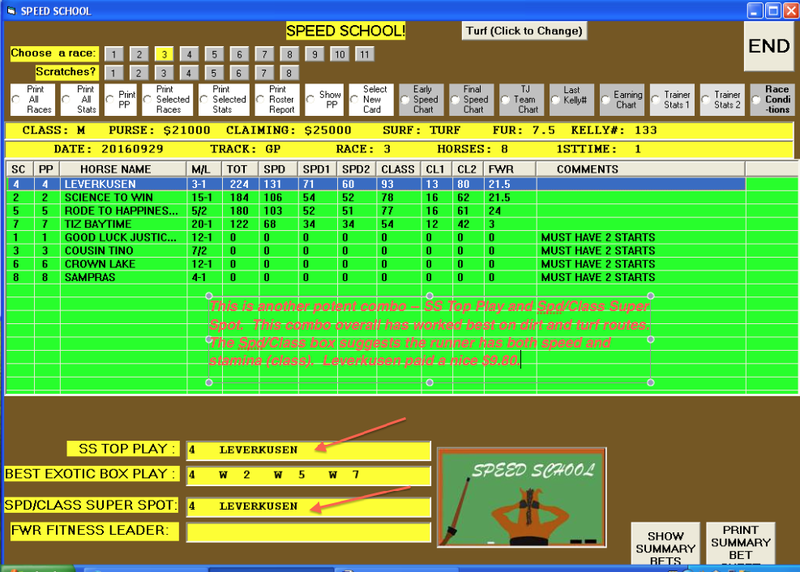 Horses fitting the requirements in this box are also often capable of doing well in dirt and turf route races. 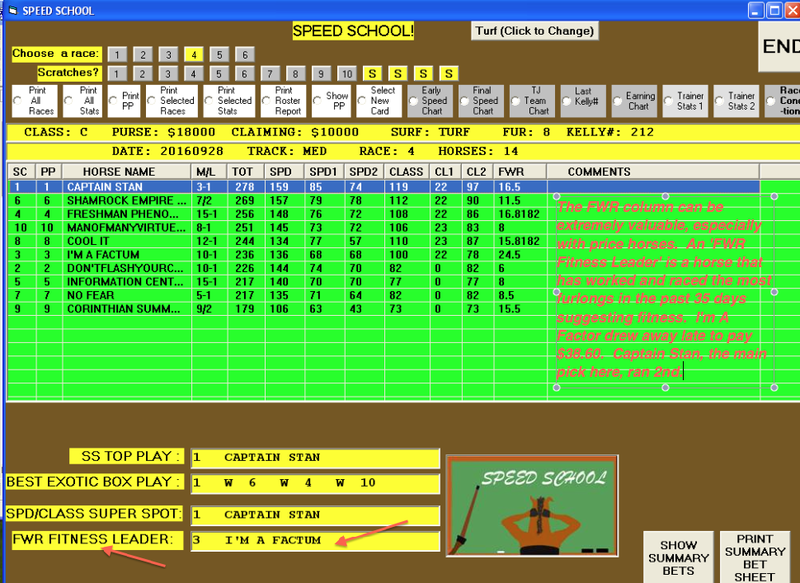 The Speed School Software, of course, includes all of the popular RPM Program features: View/Print PPs/Daily Program/Extensive, up to the minute Trainer stats/Graphic Chartings for speed, pace, earnings, class, jock/trainer combos/ Summary Bet Sheet that displays all of the day’s plays without having to look at every individual race, etc., etc. 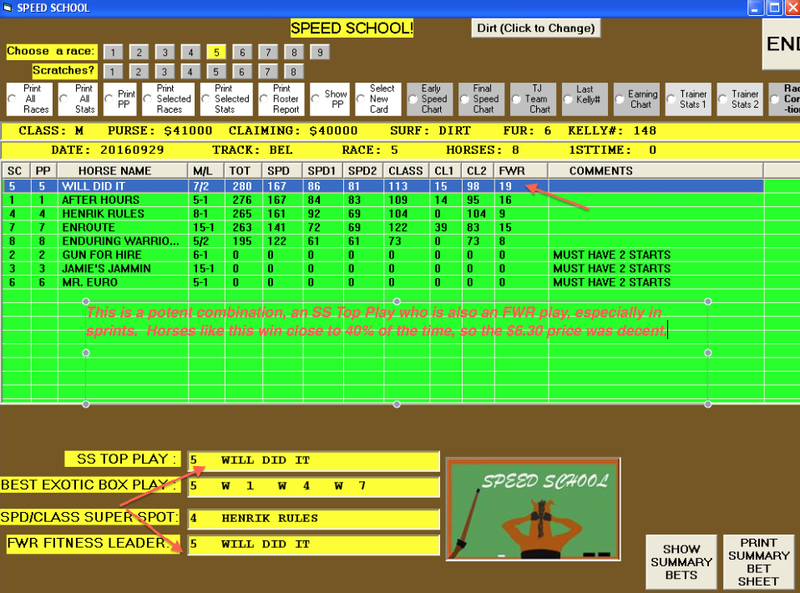 So get yourself into a new ‘Speed’ Mode and hit the ground running with SPEED SCHOOL! Works at all tracks, large and small, and >>even produces solid results in races for Quarter Horses.